No Valentine’s Day Is Complete Without It! It’s Valentine’s Day, which can only mean one thing – time to break out your favorite, most romantic jams! Sure, you’ve got the staples; Journey’s “Faithfully” and “Open Arms” and we all know that Cupid’s big day just isn’t complete until you’ve serenaded your better half to Bryan Adams’ “(Everything I Do) I Do It For You,” but there’s another tune that today was absolutely made for a little Valentine’s Day lovin’ and, odds are, you’ve totally overlooked it. Never fear, we’ve gotcha covered! 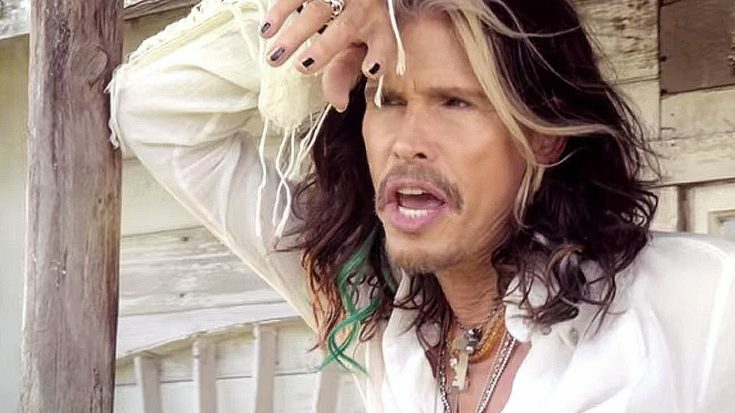 Steven Tyler’s 2015 release “Love Is Your Name” is the ultimate in love songs, one that finds the 69-year-old rock legend leaving his hard rockin’ past in the dust to embrace his newfound country roots and y’all, we don’t know how we ever got along without it. If there’s anything we’ve learned about Steven Tyler in the nearly 50 years he’s been part of our lives, it’s this: expect the unexpected, and expect him to do it better than everyone else. Tyler raised eyebrows in 2015 when he announced plans for his first solo debut, a marked departure from Aerosmith’s hard rocking roots to come in the form of a country album. Calling forth the influences of his youth – The Everly Brothers, Patsy Cline, Dan Hicks, and The Lovin’ Spoonful, Tyler set off for Nashville that year and began working with some of the city’s best and brightest in songwriting, with “Love Is Your Name” emerging as the first song out of those sessions. His debut solo album We’re All Somebody From Somewhere arrived one year later and with it, a brand new conversation not just about what country music isn’t, but what country music is and has the potential to be. Every bit as earthy and sensual as the man who wrote it “Love Is Your Name” is the perfect blend of influences; it rocks hard enough to allow you to get up and dance, while the rootsy, Americana influences in it are soft enough to take you back to the days when fairy tales were real and you were sure a cowboy was coming to sweep you away. Throw in that fiddle and slide guitar playing, and you’ve got yourself a recipe for a gorgeous little country love song that’s sure to set the tone for a Valentine’s Day to remember. Check it out in the video below and remember – whether your day consists of romance and chocolates or waiting til your local CVS has chocolate 50% off, your friends at Society of Rock will always love ya. Happy Valentine’s Day!